Five years ago, we created the steel tool for a 19mm six-sided die where we replaced the "ones" face with a Cthulhu icon. We sold these dice online and handed them out at shows. But for most, this d6 design was an unknown item. Out of the world's population of dice fans, only a fraction of a percent even knew that this design existed. Last fall, at our special retailer event in Austin, a few of the attendees saw the die for the first time . . . and they wanted it. "This," we were told, "is something that I want to sell in my store." We sold a few unpackaged dice that day, and we started thinking about how best to take the die into distribution. 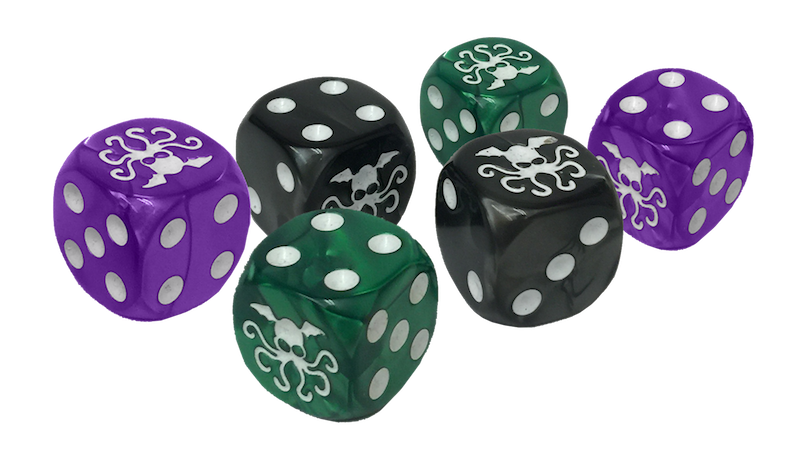 Coming in March, the Cthulhu D6 Dice Set is a package of six big 19mm dice. Every package is identical and includes two black pearlized, two green pearlized, and two purple pearlized six-sided dice. You can use these with almost any game!